Though not quite designed for the city, the SRT4's looks are architectural. Instead of taking the truck-like exterior of the Caliber RT and making it appear sporting, Dodge's design team has embraced what they were stuck with and given the vehicle a unique, rough, look that isn't completely unlikable. The interior of the SRT4 is still a bit too much like the interior of the stock Caliber to be enjoyed as a sports car, especially with the inclusion of the exceedingly cheap plastics. Nevertheless, the cloth sport seats with the red contrast stitching are reasonably sporty looking and quite supportive. The leather-wrapped steering wheel is comfortable and the SRT4 gauges are easy to read and give some hint that this particular model isn't your grandma's econobox. The 2.4 Liter DOHC inline-four features a small TD04 turbocharger connected to a relatively large intercooler mounted behind the grille, giving the trained eye a hint of the power lurking underneath. The little turbo spools up quickly and, given enough juice, propels the Caliber nearly as quickly as the Neon SRT4 that proceeded it, despite the addition of nearly 200 pounds. Anyone who drives around Chicago can attest to the fact that, on most streets, one encounters a real-life example of every Driver's Ed video ever seen. Delivery trucks pull out of alleys you didn't notice, people on bikes zig and zag out of traffic, and pedestrians appear out of nowhere, making the brakes of utmost importance. In this case, the SRT4 was a worthy car for the Second City. The massive 13-inch vented disc brakes up front are shared with the Charger and provide serious stopping power without fail, even on snowy streets. It feels as though the team behind the SRT4 was asked to set-up handling and ride in a way that would benefit both the more casual driver and the weekend racer. Unfortunately, both consumer types will be disappointed. If you don't plan on utilizing the car's MacPherson strut front suspension for spirited driving, you'll be bummed by the jolts you're going to experience on anything but smooth roads. Respect should be given to whoever engineered the anti-sway bars, as the SRT4, which feels nearly as tall as it is, manages to keep the driver from feeling as the car is going to tip over when engaged in serious maneuvering. Unfortunately, the same cannot be said for the ESP. I was treated to an impromptu test of the car's electronics when it began to snow and found myself on the wrong side of a snow plow. The traction control light flicked on and off like it was part of a pinball machine. I never felt as though enough power was getting to the ground. The Gertrag six-speed manual does its part in getting the hatch moving, providing crisp throws the whole way. The only complaint I have about the gearbox is its placement, neither high on the dash like the Civic SI, nor placed conventionally low. Once you get used to it isn't quite so annoying, but it's a drawback for those with long arms. The audio system is routed through the navigational display, which is slightly awkward when flipping through the stations and trying to navigate at the same time. It's not a major flaw, but the new Chrysler system looks much better. Controls for the audio system are set behind the steering wheel, as opposed to integrated into it, which is something I prefer for a sports car. It suddenly takes the joy out of driving if the steering wheel is too cluttered with controls. Because of the flat tire, I ended up driving two Caliber SRT4's (a pre-production and a production version). The only difference between the two was that the production model featured extra electronics, including the UConnect Hands-Free communications system and navigation. The UConnect system worked well, integrating with my bluetooth-enabled Samsung phone and providing ample sound quality (though the voice recognition, as always, left something to be desired). The nav system, on the other hand, was of the dial-and-enter variety found on other Chrysler products—not the new touch-screen version found on the new 300C. I wasn't a big fan. The most unique feature on the SRT4, and the one worth the actual money (skip the navigation system if you want to save some scratch) is the performance display. Using a button next to the right reconfigurable display, the driver can switch from showing the temperature to screens that measure acceleration (0-60 mph, 1/8 mile and 1/4 mile) G-force and braking distance. I wouldn't bet my life on these numbers, but it helps when bragging to friends. Why isn't this feature on more cars in this class? With a price of $22,435 the SRT4 is a decent value, providing a lot of power and a fair amount of space. Nevertheless, there are better cars available at a similar or even lower price. For example, the Mazdaspeed3 comes in at about $200 cheaper and offers a slightly higher level of refinement. If you can do without the extra doors, the VW GTI starts with a base that's $400 less expensive. The SRT4 never quite achieves what it's going for in terms of style or performance. Look at it straight ahead and there's something bold about the style, but step back and you'll notice the lines that still make it a Caliber. Open it up on the highway and there's enough power to get you smiling, but drive it on less-than-stellar roads and there's enough uncertainty to get you to slow down. I don't see it gaining the same following as the original Neon SRT4. 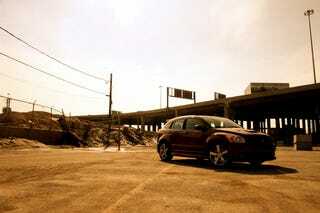 Part One of the Dodge Caliber SRT4 review appeared yesterday, Part Three will appear tomorrow.